In the previous section a basic web application was created and tested to encure that all the necessary components are present and configured correctly. 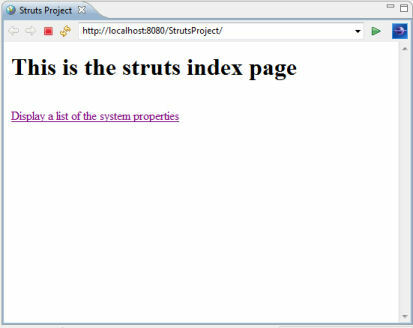 In this section a Struts page that lists system properties is developed and run. the uri for the tag libraries is found by opening up the struts jar file struts-taglib-1.3.8.jar. It contains the tld files. 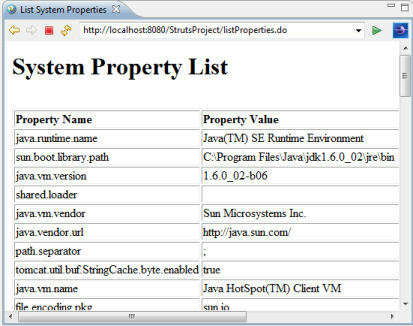 For example, the file struts-html.tld, when opened in a text editor, contains the line "<uri>http://struts.apache.org/tags-html</uri>"
The JSTL core tag lib is used. The uri specified is "http://java.sun.com/jstl/core_rt". This was found by opening up the struts jar file standard-1.0.2.jar, and looking at the tld files' content. In the next section facilities to edit system properties are added.